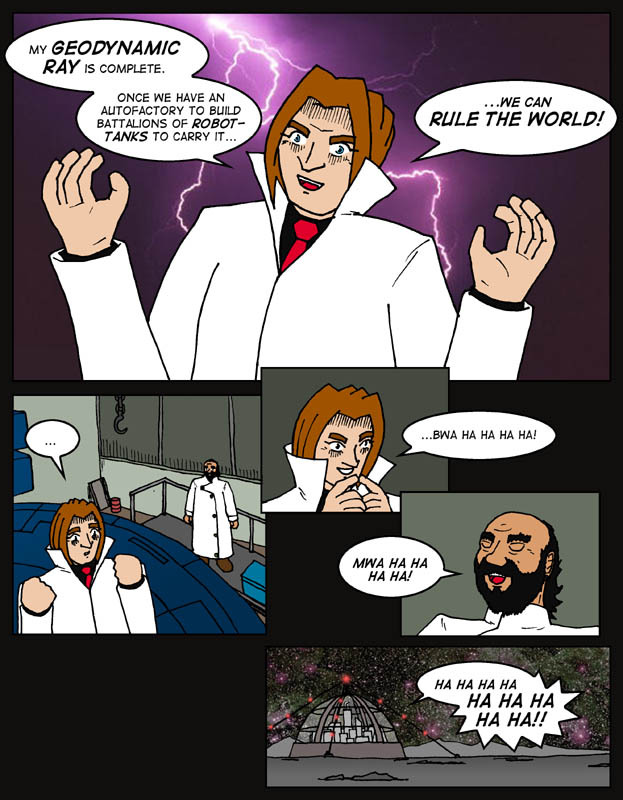 You just know that mad scientists have evil-laughter competitions. If you know the name of the real-life mad scientist who claimed to have built a geodynamic gadget that could have destroyed the Earth, award yourself ten points and one free robot tank to start your world conquest off on the right foot, er, tread. The answer will appear in this space next Sunday. I would also like to highlight the red barrel in the corner of the warehouse in Panel 2. This traditional bit of generic scenery is there to honor the release of ID Software's Doom 3. Speaking of both next Sunday and fancy tech demos, I will be at SIGGRAPH 2004 in Los Angeles next week. I am not mentioning this to brag -- well, I am a little -- but more to state that it's possible we may miss a day next week due to all the rushing about. What happens will depend on my and Jon's schedules, but I thought you should have fair warning. Finally, I wish to mention that as I sit here, within arm's length is a newly arrived stack of science fiction books. They are The Atrocity Archive, Singularity Sky, and Iron Sunrise by Charles Stross, Redemption Ark by Alastair Reynolds, and The Witches of Karres by James H. Schmitz. You probably can't quite tell over the Internet, but as I gaze at those books there are adorable little cartoon hearts floating over my head.